MPQ8633B would be the Buck IC with similar specs, I have info on that one too. No high power Boost-Buck that I am aware of yet, but the MP28164 is a 4.2A Boost-Buck chip. Not affiliated with MPS in any way, i just found their catalog and thought they make some nice chips for flashlight drivers. Both of those are interesting options. The MPQ8633B looks real good but it is hard to tell from the cover sheet, is the output voltage limited to 5.5v? Or is that just the reference voltage? The MP28164 looks like it would make a great general use driver for small lights as you don’t need more then 4A anyways in most cases. I also like how few external components it needs. Vout max on the MPQ8633B is 0.9 of the input, or 5.5V depending on the input voltage. Yeah, thats how I read it as well. Sad it would not work for higher voltage LED’s, if it supported outputs up to 16V like the input it would be great. The output voltage is limited to 5.5V, good catch, I didn’t see that. In that case, the MPQ8632-20 Is probably the better candidate, up to 13V output and similar in other specs. Little bit larger footprint though. The MPQ8632-12 has the same size footprint as MPQ8633B but a 12A limit (still probably enough). Hmm, 13V is not quite enough for a 12V LED at reasonable currents but at least it would handle 6V LED’s. Who knows maybe they have some wiggle room in the voltage tolerance and could handle ~14-14.5v, kinda like how we push everything else past the datasheets as well lol. There are certainly plenty of high powered Boost-Buck controllers out there, but many require 4 external MOSFETs which makes space a problem. Using some super small surface mount FETs it might be possible to build something in the 30mm range. LTC3780 comes to mind here. 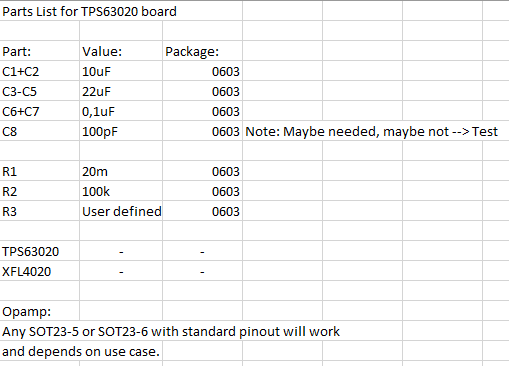 I’m willing to bet the MP8632 would output beyond 13V by a bit, similar to how the TPS61088 will actually max out around 13.7V instead of 12.5 like the datasheet says. We do tend to operate a lot of things outside of specs here. Haha. Yeah, those FET’s really eat up the space which would already be tight without them. Thats what makes these chips so attractive. Plus the lack of FET’s reduces the complexity which is always good for small designs. Maybe I can get an ATTiny13A on the MP3431 board, for biscotti-HD. To control the IC I would use the method used in the H2-C.
How about ATTiny85 for e-switch? The 85 isn’t available in a package small enough to fit the underside of the board, I need 3×3mm, even 4×4mm is too big. First try on a 1-mode Buck-Boost converter for 2-3AA or 1 LiIon cell: It uses a TPS63020. You have to calculate max current yourself (see page 13 in the datasheet), but it can do more than 800mA, even worst case. The current can be programmed via one resistor. There’s a jumper as well to choose between normal mode and low current high efficiency mode (see figures 10 and 11 in the datasheet). OK, I thought you meant the usual SOIC-8. Anyway, there are many great uses. Though I think there are uses for 20+ mm variants with e-switch too. Forgot that, the inductor is 1.5uH. But I haven’t tested the circuit myself, so I just can hope it works. I will check the pinout one more time. I can recommend some Opamps, but I need the input voltage range for that. To get 1.4A, your resistor R3 should be as close to 5932.2 Ω as possible. Less resistance for less current, more resistance for more current. I too would like to build a UV light. Looking for a boost driver for 2×26650 to get 15V 1A to LED. Doesn’t need anything except on/off. Forgot that, the inductor is 1.5uH. But I haven’t tested the circuit myself, so I just can hope it works. I will check the pinout one more time. I can recommend some Opamps, but I need the input voltage range for that. To get 1.4A, your resistor R3 should be as close to 5932.2 Ω as possible. Less resistance for less current, more resistance for more current. Yes this OpAmp will do it. Due to the 2mV maximum offset the current could be between 1.3-1.5A. If you only want on/off you can just use one of those buck converters from AliExpress. I use one too for my 3*26650 light with a 100W COB in front. Take the OPA365, the microchip parts seem to have a really high input offset drift when the supply voltage changes. could you share that board? - ability to lock out programmability with closed solder junction. Sounds more like you need custom firmware instead of custom hardware. Any of the BLF FET drivers should support that hardware wise. Can you Recommend a 17mm Driver (single cell) for xhp35 ? I currently try to make one. PCB is nearly finished, but I need to find an ATTiny25v rev. E in qfn package. I maybe will order from different shops, maybe some have the revision E.
Attiny13 is good too and Much cheaper , the only Problem with it is the 1024 byte Flash. Thanks Jensen567, you are almost certainly right. If I could make it simpler, cheaper, higher output with a custom driver that would be great, but custom firmware is the place to start for sure. It uses a TPS63020. You have to calculate max current yourself (see page 13 in the datasheet), but it can do more than 800mA, even worst case. The current can be programmed via one resistor. There’s a jumper as well to choose between normal mode and low current high efficiency mode (see figures 10 and 11 in the datasheet). I reflowed the driver, but it seems dead any test I can do? read the TI datasheet is says that the power safe mode pin must not be open, it has 3 pads so I have to solder bridge one?